They are impassable, so you can not attack them or even move into or over them. Most territories have an income (IPC = industrial production certificates) ranging from 1 tot 12. Each turn you can move the controller with this value. A few territories like Gibraltar have no IPC. Sea zones are friendly or hostile (with enemy surface warships). Note: The presence of enemy submarines and/or transports don't make a sea zone hostile. This is a territory located inside one sea zone. Air units can land on them and land-based troops can disembark on islands. There are two canals: the Panama Canal and the Suez Canal. They connect two seas or ocean's but don't block land units. To move sea units through a canal, your side must control it at the start of your turn. There are 18 victory cities on the map, based on their historical importance (industrial, strategic, other) in 1942. Each city has a corresponding token which is exchanged when the territory is lost or won. Antiaircraft guns and industrial complexes are light gray. Assign a power or powers to each player. 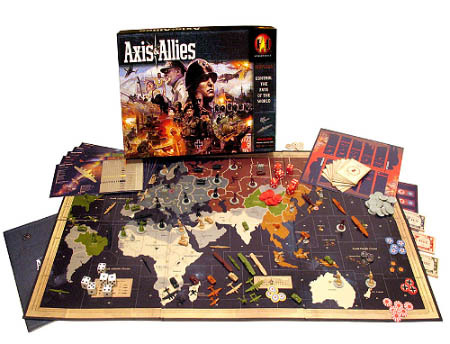 The Axis players sit in the southern edge of the map, the Allies near the top (north) of the board. The battle board should be placed next to the game board and the dice next to the battle board. National production/research charts should be also next to the game board. Each player gets the victory city tokens and IPC's that correspond to the powers. The U.S. player takes China's turn at the same time as the U.S. turn but Chinese unit combat and movement are done separately from the U.S. forces. The IPC values printed on the Chinese territories indicate the number of IPCs an Axis player will receive when taking control of the territory while China gets one new infantry unit per turn for every two Chinese territories that are not under Axis control during the Purchase Units phase of the U.S. player's turn. Chinese units have a limited range of occupation, displayed by the colored border. 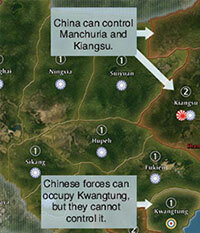 They can also be moved into Kiangsu and Manchuria. Chinese units cannot be loaded onto transports. Kwangtung is a special case because it is not a Chinese territory and cannot be controlled by China. Chinese forces can attack Axis units there and occupy it, but the IPCs generated go to the United Kingdom. This is the only non-Chinese territory that Chinese units may occupy. At the end of the United States player's turn, check for victory. If neither side has won, begin a new round of play. Each token cost 5 IPC's. For each token, you roll one die. If you rolled a "6" on any research die, choose one of the two breakthrough charts and roll a die to see which advance you get. If your research was succesful, place one of your national control markers inside the advancement box. Your new development becomes immediately effective. Any number of powers may develop the same technology. It's time to spend IPCs for extra units. All the units on your power's national setup chart are available for purchase. 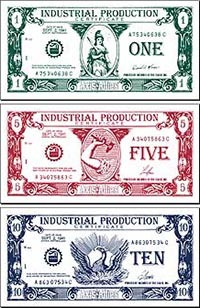 Each industrial complex can only produce as many new units as the IPC value indicated on the territory in which it is located, but for each damage it can produce one less unit. Select all units you wish to buy. Pay the total cost of IPC's to the bank. Each damage marker cost 1 IPC to remove. 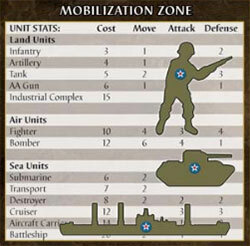 Place the units in the mobilization zone (in Sout Atlantic Ocean). Move as many of your units into hostile territories or hostile sea zones. Movement into hostile territories counts as combat movement, even if this territory is not occupied. You may move units through friendly spaces en route to hostile spaces. If you move all your units out of a space, you keep control of that space (until an enemy moves into it). All combat movement happens at the same time. You can not move extra units into a battle during the battle. Enemy submarines and transports don't block any unit's movement and an attack to that unit is not required. 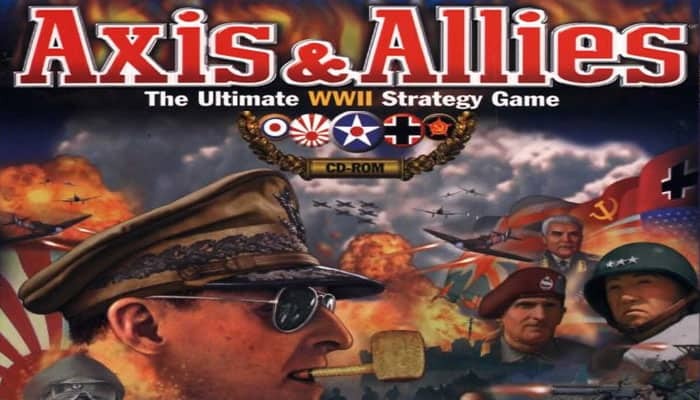 An Allies power can never attack another Allies power (or an Axis power attack another Axis power). You can bomb the enemy's industrial complexes with your bombers. After resolving any antiaircraft fire, suriving bombers each roll one die. The total is the number of damage markers that are placed under the attacked industrial complex. A bomber that performed a strategic bombing raid, may not participate in any other combat. If there are defending warships, sea combat must happen first. If there are only defending submarines or transports, the attacker must choose to combat or not. If a sea combat occurs, then all attacking sea units participate. 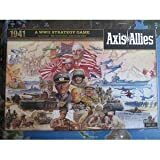 If there was NOT a sea combat, accompanying battleships and cruisers may bombard the coastal territory being attacked. Roll one die for each battleship and cruiser. The battleship hits on 4 or less, the cruiser hit on 3 or less. For each hit, the defender moves a unit to the casualty zone but they will be able to defend during the land combat. Attacking land units can come from the ocean and they can come from adjacent land territories. If no land units survived the sea combat, or when the attacking sea units withdrew from sea combat, then any other units that participated in the land attack must still conduct one round of land combat before they can retreat. If the attacker don't have any attacking land units left, the assault is over. Attacking seaborn units can't retreat! Attacking overland units must retreat in group at the same time to the same place. Defending air units can only participate in the land combat, not in the sea combat. The number in a unit's column identifies that unit's attack or defense value. e.g. An attacking infantry is 1 and een defending infantry is 2. Cargo does not roll (in sea combat) and is lost when the transport is destroyed. Submarines have a surprise strike attack. Both attacking and defending submarines fire before other combat units during a sea battle. An attacking unit scores a hit when you roll its attack value or less. After the attacking player has finish rolling, the defending player chooses units for each hit score and move them to the casualty zone. All the units on the defender's side roll one die for each unit with the same defense value at the same time. A defending unit scores a hit if you roll its defense value or less. The attacker chooses units for each hit scored and removes it from play. 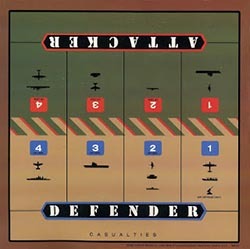 The defender remove the units in the casualty zone from play. If you win a combat as attacker and you have one or more land units left, you take control of the territory. Else the defender stays in control. Air or sea units cannot capture a territory. 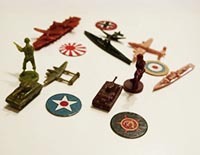 Remove the surviving land units from the battle board and place them back on the game board. When the control of the territory changes, then the control markers and production markers will change too. An antiaircraft and industrial complex remains in the territory and belongs now to the side of the new owner. You can move any of your units that didn't moved in the Combat Move phase. Move your troops, either to strengthen vulnerable territories or to reinforce units at the front. Also, all your aicraft that survived the Combat Phase should land now. Only aircraft and submarines may move through hostile spaces during this phase (to any territory that was friendly at the start of your turn). Move the newly purchased units from the mobilization zone on the game board to spaces you have controlled since the start of your turn. You cannot yet use industrial complexes that you captured this turn. For each industrial complex, you can mobilize only as many units as the IPC income value of the territory containing the industrial complex. This limit includes also the adjacent sea zones. You cannot place your new units at an industrial complex owned by a friendly power, unless that power's capital is in enemy control and you have taken control of the industrial complex from an enemy power after the friendly power's capital was captured. Place new industrial complexes in any territory that you have controlled since the start of your turn and that has an income value of at least 1. You cannot have more than one industrial complex per territory. If you do not place some of your units the turn you purchase them, they are not lost. Look up your power's national production level on the national production chart and collect that number of IPCs from the bank. If your capital is under an enemy's control, you can't collect a bonus income. A power can NOT lend or give IPC's to another power. When you have reached your national objectives, you can receive a bonus income of 5 or more IPCs per turn. 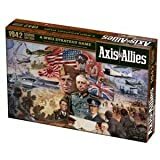 At the end of the United States player's turn, check to see if either side has won the game based on the victory condition you are playing.